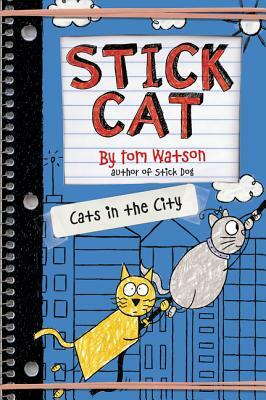 With over-the-top fun and humor, this scrumptious story features Tom Watson’s trademark laughs, adventure, and hilarious stick-figure drawings, perfect for fans of the Stick Dog, Big Nate, Timmy Failure, and Diary of a Wimpy Kid books. Stick Cat is going somewhere he’s never been before—his best friend Edith’s apartment. It’s got everything: donut crumbs in the sink, a fire escape, and a window with a great view of the big city. While admiring the view, Stick Cat sees trouble. Hazel, the bagel maker, is in serious danger in the building across the alley. Stick Cat will use his smarts—and Edith’s appetite—to devise a rescue plan. But can Hazel hang on long enough for this dynamic duo to save her?